Pennsylvania State is a public research university located in rural Centre County Pennsylvania, often referred to as Happy Valley. 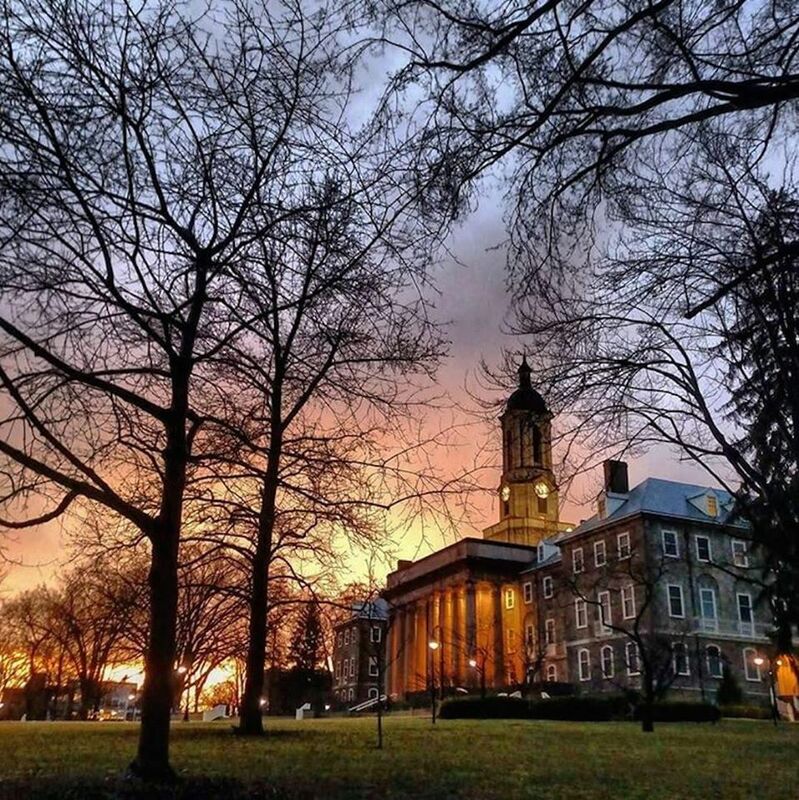 Penn State is a very large school with an undergraduate enrollment of 41, 359 who call the University Park campus home. Penn State’s sports teams are a big draw. The school’s famous mascot is the Nittany Lion and teams compete in the Big Ten conference. The town of State College, across the street from campus is widely recognized as one of America’s best college towns with a variety of restaurants, coffee shops, bars and stores. Transportation: The local airport in State College is the University Park Airport (SCE). It is located approximately five miles from campus. Taxis and car rentals are available at the airport. The Megabus offers non-stop service from New York City, Pittsburgh, Harrisburg, and Philadelphia. Greyhound offers bus services all across the country. (Greyhound Bus website) Train travel is not recommended, as State College does not have a train station. The closest train station is 45 minutes away in Lewistown, PA.
Stay: Everyone’s first choice is the Nittany Lion Inn, located right on campus. Looking for an upscale, elegant stay? Look no further than Carnegie Inn and Spa. Other hotels options include the Spring Hill Suites by Marriott, the Hilton Garden Inn, Hyatt Place or the Penn Stater Conference Center Hotel. Coffee: Start the day with a cup of cold brew or some baked goods at Saint’s Café, a local favorite where in nice weather the students grab an outside seat and cram for exams on their laptops. There are three Starbucks locations in State College, one on campus in the HUB and two conveniently on each end of College Ave. Yes less local, but very convenient. The Berkey Creamery, located on campus may be known for their ice cream, but they open at 7 am and serve excellent coffee as well. Breakfast: The legendary lines attest to the Waffle Shop as the #1 place for breakfast in the area. There are multiple locations, one just off campus downtown. (The original location is a few minutes drive north.) Another popular spot is The Naked Egg Cafe. Feel like a student and grab a bagel on the run at popular Irvings or Bagel Crust. Lunch: Students and parents rave about the sandwiches and the short rib nachos at the Happy Valley Brewing Company. Alums return again and again to the Corner Room, a historic and nostalgic stop when visiting PSU. For a quick bite try Fiddleheads, good for soups and salads, or the Deli and Z Bar serving NY-style deli favorites. Casual: Burgers are a must (lunch or dinner) at Otto’s Pub and Brewery, known for creative combos washed down with beer distilled on-site. Go hungry for the schnitzel at Herwig's Austrian Bistro. Home to the best wood fired pizza along with another Italian fare Faccia Luna, a cozy trattoria, is a short drive from downtown. A Step Up: Enjoy contemporary American fare at The Allen Street Grill—the view of the gates of Penn State and the famous mall are an added plus! For a farm to table experience book a seat at Gigi’s featuring a locally grown and southern inspired menu. Late Night Snack: Students have wings delivered to their door from Wings Over Happy Valley, a Penn State ritual. Open till 2 am with a evening menu to compliment their extensive cocktail and whiskey list, stay up way too late at Local Whiskey. Local Attractions: You must indulge in a cone at Berkey Creamery where they have been making ice cream for over 100 years! The Berkey is a PSU institution—its very own ice cream shop right on campus and the largest university creamery in the US. Everything is made fresh through the Department of Food Science and ships to 48 states! Mount Nittany is a popular place to hike and it is the namesake for the Penn State mascot, the Nittany Lion. The Penn State Arboretum is spread across 395 acres right on campus. Just toured the Penn State Campus? Are you a Penn State student, parent or Alumni? Fill out this 2 minute survey to supplement our Daytripper University Guide for Penn State!